We love burnt ends. 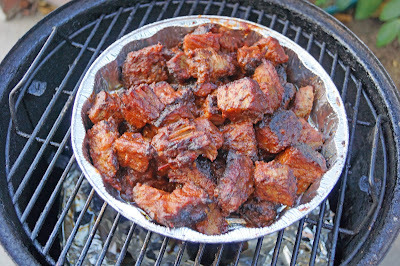 Burnt ends are the point end of a brisket that is smoked, cubed and sauced. 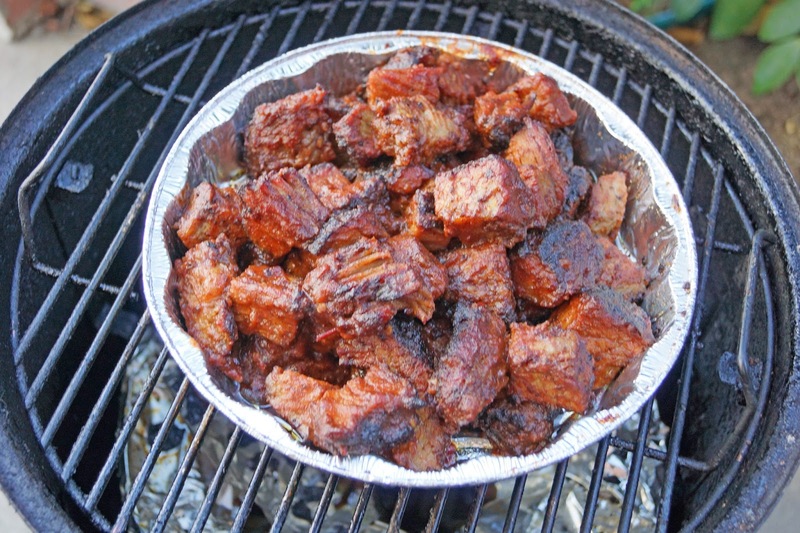 To make burnt ends is an all-day process that is worth every ounce of effort. 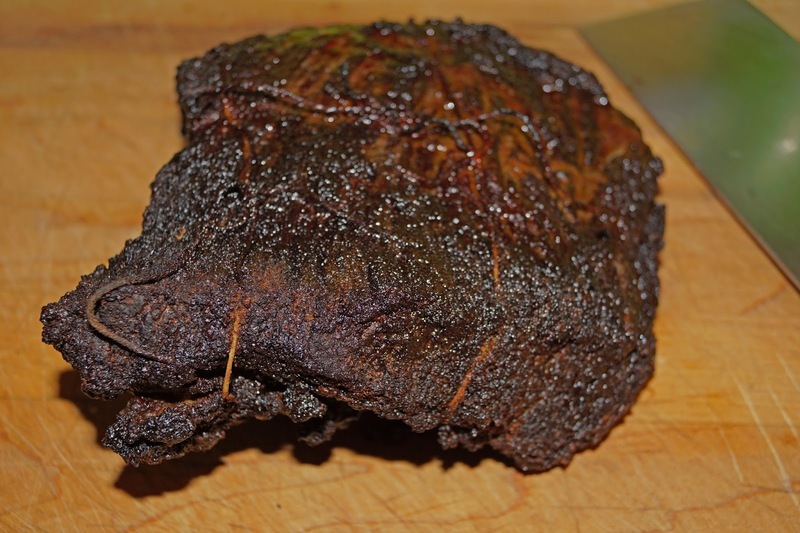 We procured this point end piece of brisket at the House of Beef in Oakdale California. This USDA choice hunk of beef was cradled in multiple layers of fat which was trimmed away. It was seasoned with our rub of the day. A trip to the smoker for 6 hours was the first step. 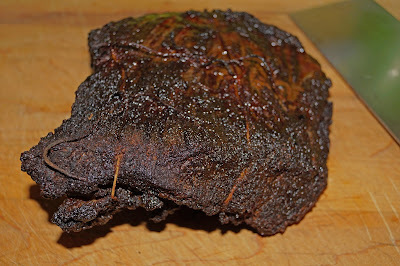 We let the brisket rest for 1/2 an hour. 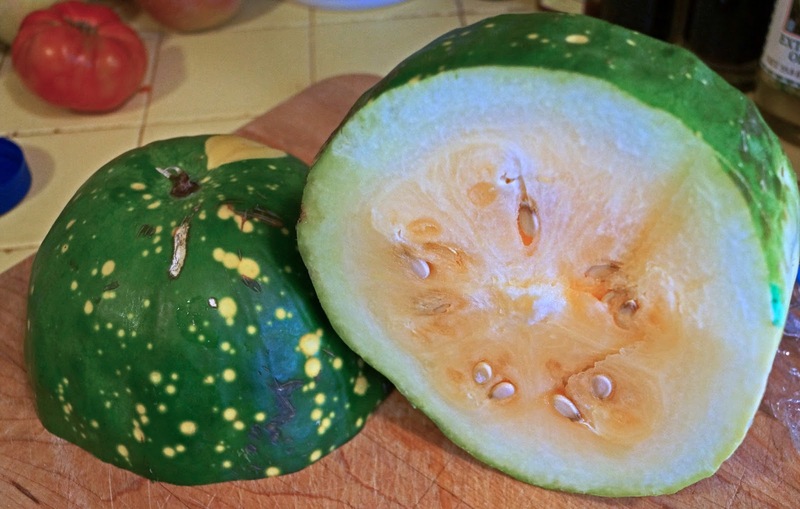 It was then cubed into chunks and seasoned for a second time. Another hour in the smoker for these beefy chunks of meat love was in order. The only thing left to do was to gild the lily. 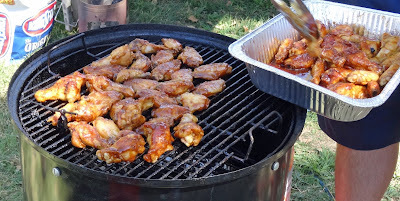 A barbeque sauce was applied and one more trip to the smoker to set the sauce would happen. We call this meat candy. Smoky, sweet, beefy, luscious, rich, and possibly the most decadent beef experience possible. What a treat. The Willowside cut is of a darker color. It is also of a firmer texture than the Kobe. 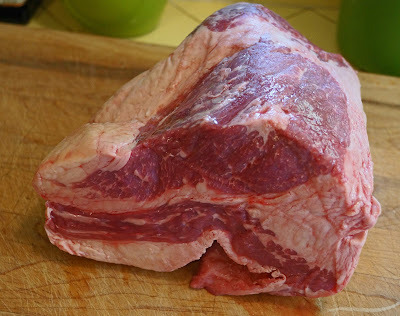 The Kobe beef has a beautiful marbling of fat and is a little softer in texture. Salt & coarse ground pepper was applied one half hour before cooking. 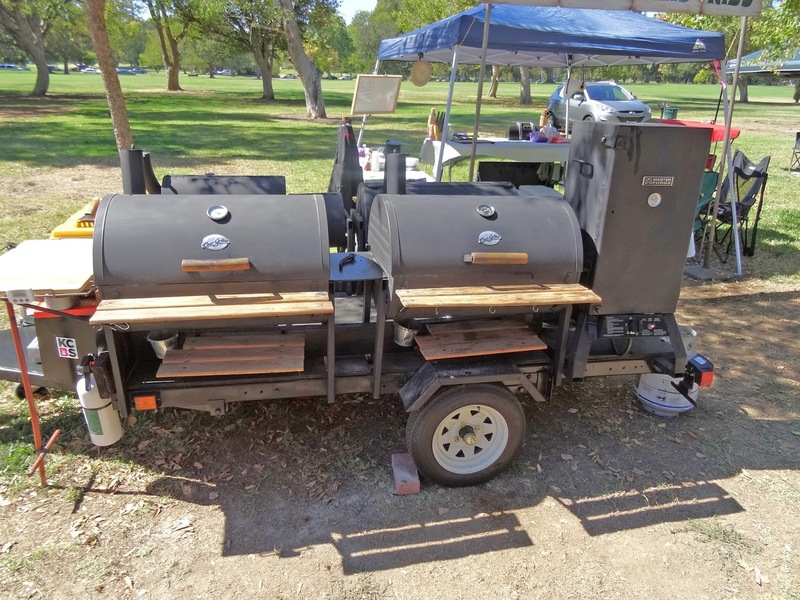 A very hot mesquite charcoal was built. This fire was popping and squirting molten heat for a quick cook time. The grill was oiled and the steaks took their respective corners. 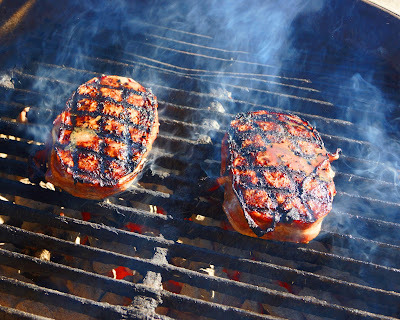 Four minutes on each side with a turn at the two minute mark for grill marks was the cooking time. Ten long minutes of rest time. Ladies and Gentlemen we have a split decision. We shall read the score cards. Was there a clear winner in the steak battle royal? Both steaks were premium in quality and flavor. They both would proudly be served at any high end steak house. Both ringside (barbeque) judges concurred on their decision. The Snake River Farm steak had butter like mouth feel that provided lusciousness to each and every bite. There was great beef flavor. There was a very so, small tug to the chew. Was it tough? 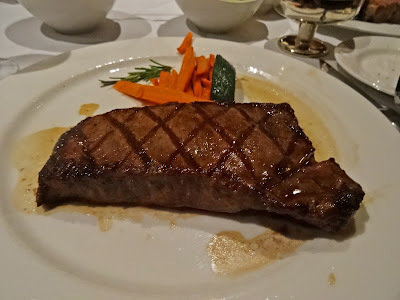 By no means, absolutely not, but compared to our other opponent the Willowside steak it was not as tender. The Willowside steak was so very tender. There was a deep, rich, concentrated, earthy, comforting beef flavor that made this beef lover swoon. 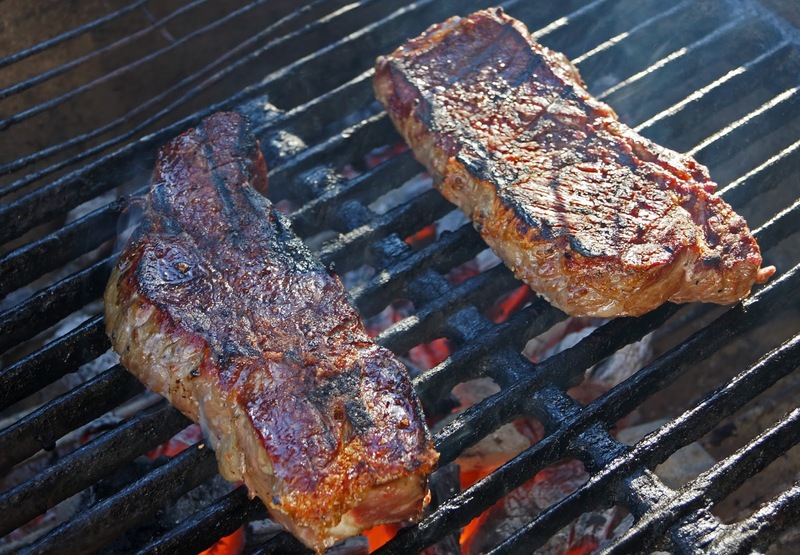 The aging process and the quality of beef produced a memorable flavor and experience that we crave. 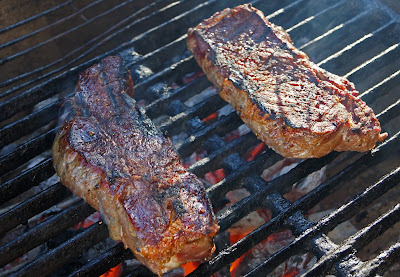 Willowside Meats aged New York strip steak will win this battle tonight. Both steaks are champions at our ringside table. 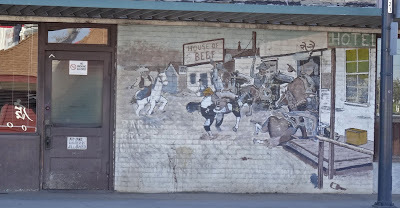 Returning from Yosemite National Park, we passed through Oakdale, the self proclaimed, 'Cowboy Capital of the World'. It was breakfast time and I had a hankerin for my favorite breakfast item of pork chops. I am not sure what drew me to this particular breakfast establishment except it had a fun old time mural directly across the street. The signage outside said Mexican and American food served here. This restaurant at one time must of been a chain because it was exactly like any other breakfast house in the nation. The only thing I wanted to share with you was the pork chop. It had been lightly dusted in Masa Harina before fried on the griddle. Masa harina is a very finely ground corn flour made from corn that's dried, cooked in water with slaked lime (which gives it distinctive flavor), ground, and dried again. It has a distinct flavor and added a Mexican flair to the pork chop. Unique and quiet tasty was the verdict. 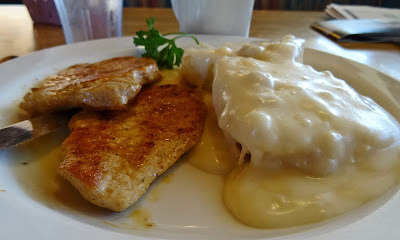 The biscuits and gravy was not so memorable.Except for the pork chop this entire place was a little forgettable proven by the fact I cannot even tell you the name of this restaurant. It seems like just last weekend we were enjoying great bbq and plenty of liquid libations. 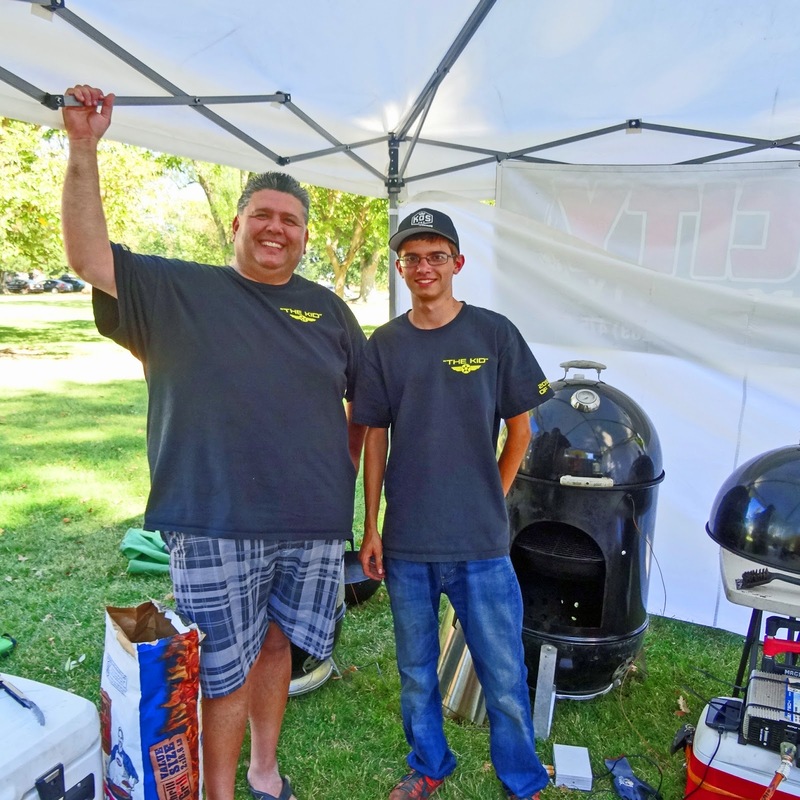 This weekend we were at a bonafied KCBS state championship. 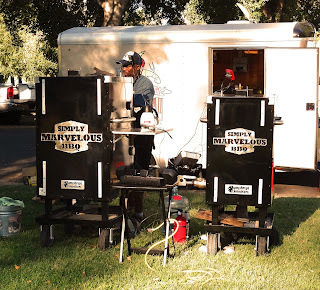 We donned our official Kansas City Certified Barbecue Society Master Judges Badges to participate in the 2nd Annual Smoke On The River competition held in Sacramento California. This too was a fundraiser benefiting the Sacramento Artist Council. 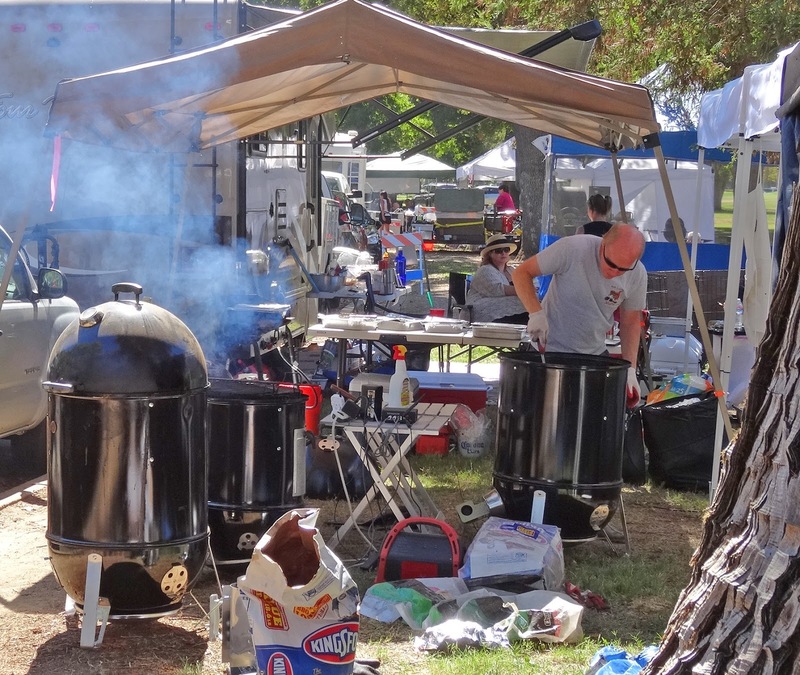 Forty nine teams battled to serve their best competition; chicken, ribs, pork shoulder and brisket We would like to share a couple of images with you. What a perfect day for an event. The sun warmed up the grounds to the mid 80's. There was plenty of shade in this tree lined park. The judges had a nicely ventilated tent to provide comfort for judging duties performed. Judges comfort is something we appreciate. We need to focus and perform evaluations to the best of our abilities. We may have experience but each and every judging opportunity is unique and has challenges which we embrace. 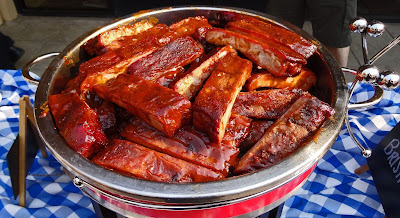 I would like to also add it is very fun to taste and score some of the best bbq in the nation. The public was admitted to a fenced in area in the park. In this area they were able to imbibe and eat to their hearts content. 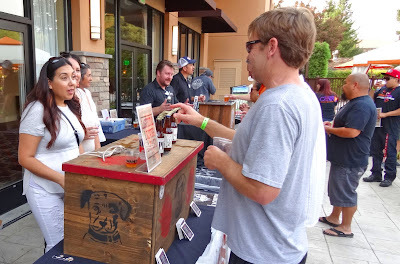 There were about a dozen different beer booths from different local microbreweries. No wine was spotted at this event. 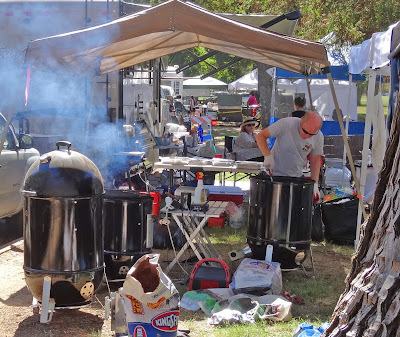 There also was a tent which dispersed barbeque offered from each and every one of the competitors. 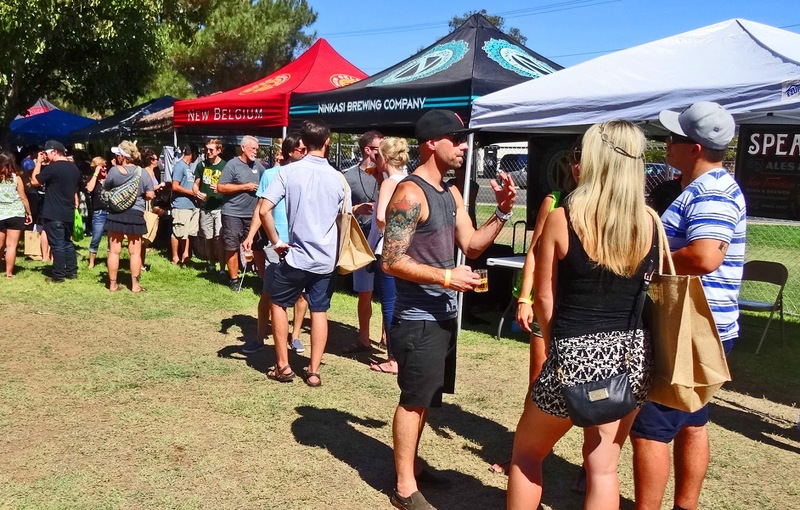 The public could sample and score their favorites to pick a "Peoples Choice' winner. While the public was celebrating with food and drink a band provided entertainment. We witnessed nothing but smiles and merriment in this arena. The winners were declared. Simply Marvelous BBQ was declared the Grand Champion. Zack "The Kid' of 'Son of Smoke' came in a respectable 8th place. He had just celebrated his 18th birthday and was returning from back to back Grand Championships. Zack is and will be a force to be reckoned with. This was another great bbq weekend. Napa Valley may be known as a World Class wine destination but they also know how to throw a party. 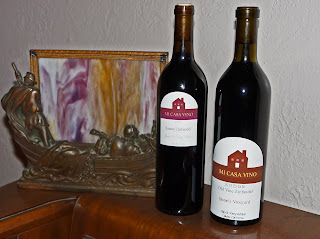 This party was to benefit the; “Napa Valley Education Foundations’ Music and Arts Program”. 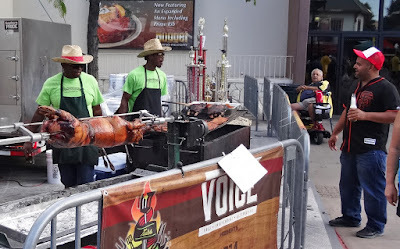 Our friend, bbq promoter and fellow Kansas City Barbecue Society Certified Master Judge Ben asked us if we wanted to partake in the festivities. This was a no brainer. Half a dozen local microbreweries’, wine and barbeque made this invite a welcome way to spend an evening. 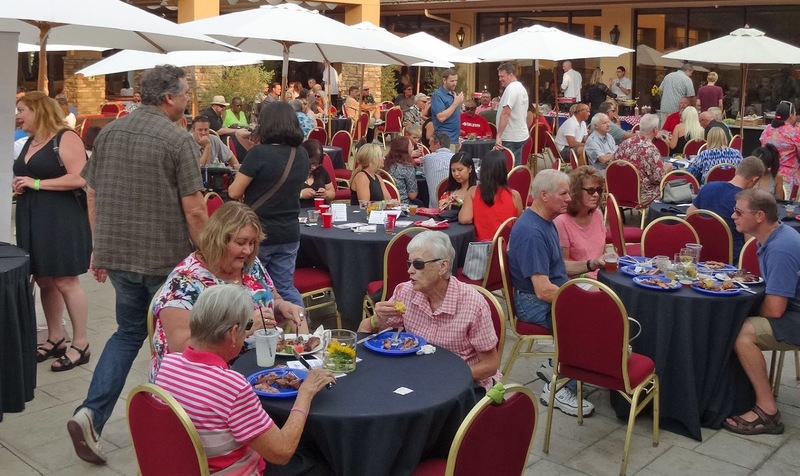 This event was held at the very posh Napa Valley Marriot who also happens to be the summer training camp of the Oakland Raiders. No football players were present but we scored plenty of touchdowns tonight which we would like to share with you. This fundraiser event had a barbeque battle theme. 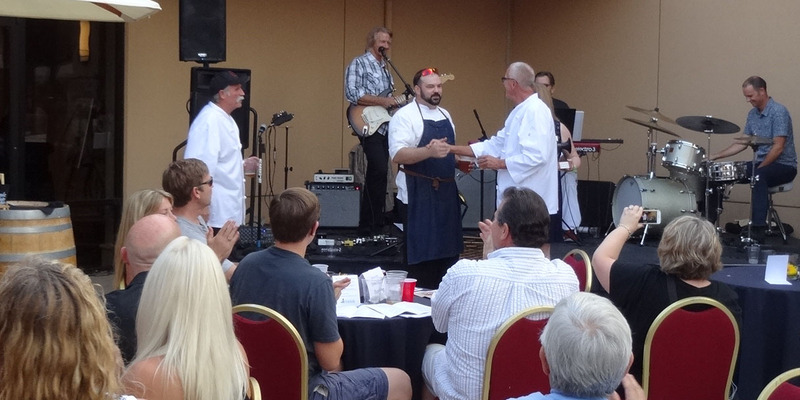 Two chefs, Pat Burke & Joey Ray would cook their best bbq dishes and the attendees would sample a blind tasting to vote for their favorite. Pat Burke is well known on the barbeque competition circuit as part of the team; “Too ashamed To Name”. 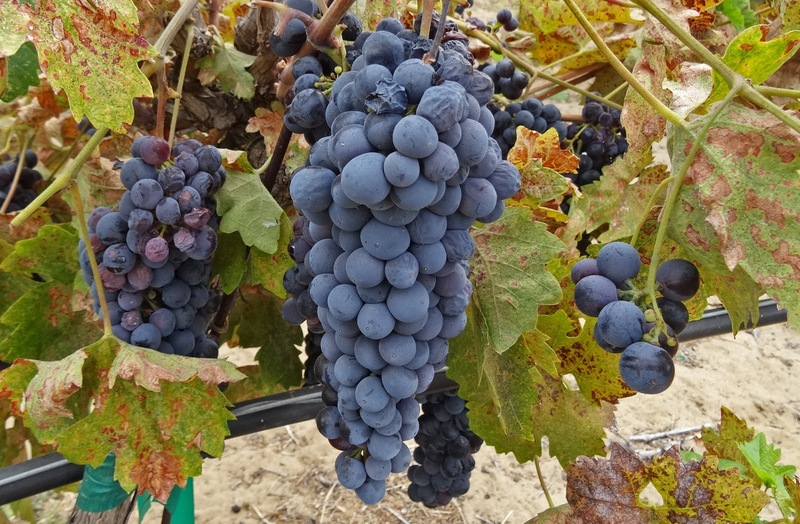 Joey Ray is the head chef at the Napa Valley Marriot. They were split into two teams; one red team and the other, blue team. The food was separated on a festively decorated buffet line. It was quit elegant seeing a pile of ribs served in silver chalices. This was some great tasting barbeque. 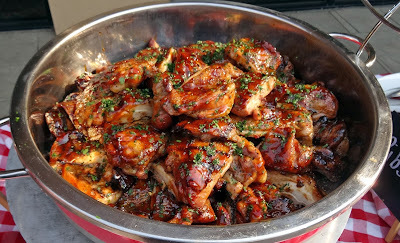 To feed a crowd good barbeque is a challenging task. 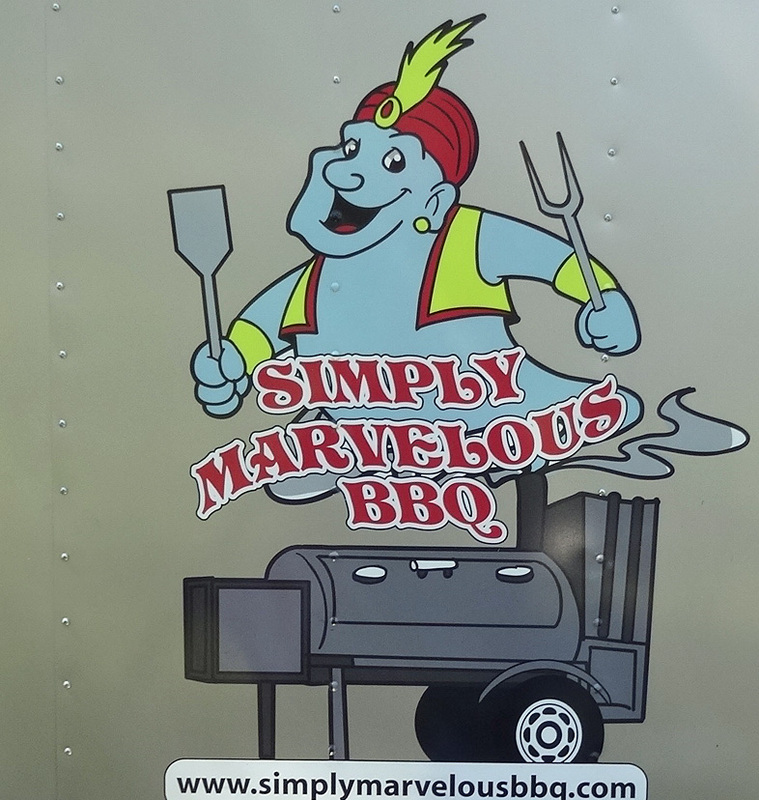 It was not competition barbeque but was very satisfying for this hungry group of celebrators. It was not an easy task picking our favorite. 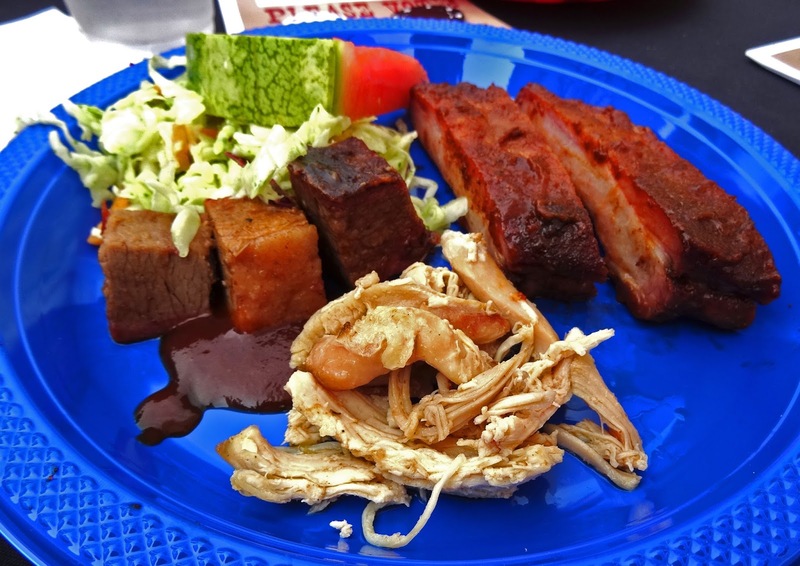 Brisket, ribs and chicken cooked in different styles were offered. 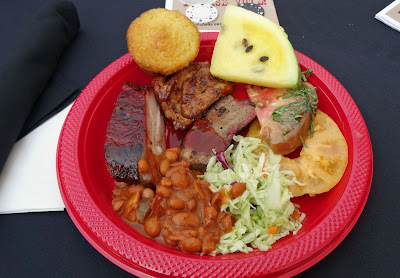 I enjoyed some of the side dishes of seasoned Heirloom tomatoes, juicy watermelon, cowboy beans, creamy cornbread, and spicy jalapeno cole slaw. When we had eaten our fill of both the red team and blue teams offering we voted for our favorite with a poker chip which was placed in a voting vessel. This was a fundraiser which offered a silent auction. Many Napa themed prizes were up for bid. 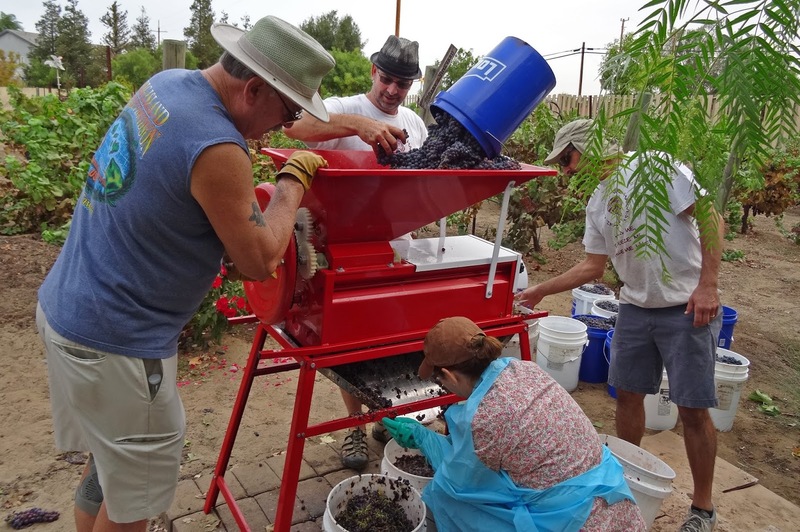 Wine packages, lodging, tours and so much more would be bid on benefiting the Education Foundation. The Oakland Raiders and the Marriott donated a suite with limo service food at an Oakland Raider game. Local microbreweries served different offerings of great tasting beer. I made a personal observation that the wine booth seemed possibly a little more popular. You know we were in Napa. Several bands entertained the well fed and lubricated crowd. It was time to announce the winner of the BBQ Battle. The Red Team headed by Joey Ray was declared the victor. Everybody was the winner tonight especially the benefators of ‘Napa Valley Education Foundation’s Music and Arts Program. Good times. The butcher told us that Wagon steak is a mixture of ground Chuck meat, spices, flavorings (one which was liquid smoke) and all wrapped in bacon. He also explained it should be cooked and eaten like any other steak. That was enough for us. We could not wait to get home and try this new meat product. We cooked this steak on a medium to high heat on a charcoal fire. We used the kettle top to prevent flair ups that would have been caused by the bacon dripping. I was a little hesitant to cook these steaks to medium rare so they were cooked to 135 degrees producing a medium doneness. A very brief rest and we dug in. This steak was juicy and beefy. They call it a steak but I would say hamburger. The seasoning was perfect except for the liquid smoke. Maybe my palette is a little sensitive to this ingredient and I would venture to say it was a little heavy handed. The bacon was crisp and yummy delicious. Overall this was a decent burger pretending to be a steak. It was fun to try but will not purchase again unless liquid smoke is toned down. As you may recall, we were ecstatic to see the rebirth of the crumb sweeper at Flemings Steak House. The simple act of a server using a specialized implement to gracefully sweep wayward bread crumbs from the tablecloth used to be standard procedure at high end steak houses. 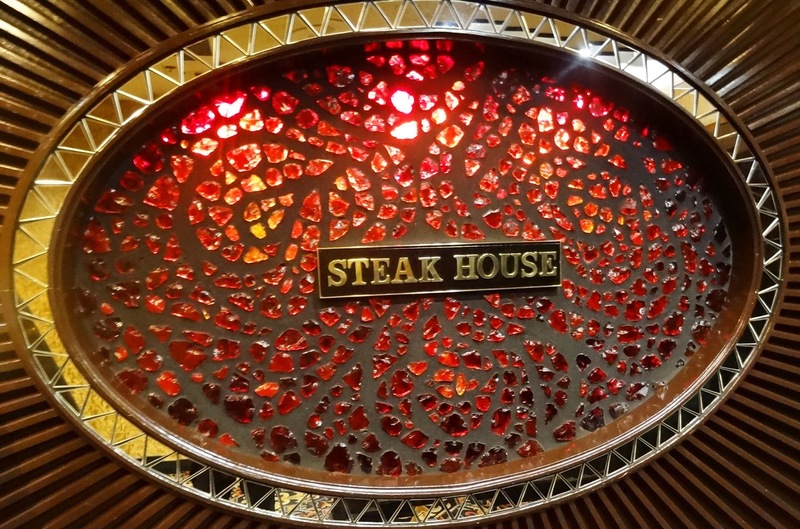 We are fans of the Harrah’s steak house in Reno. We have been going there for years to receive old fashioned, old school, stylish steak house faire. This is the place that used to have a designated crumb sweeper whose sole job was to sweep and maybe refill water glasses. 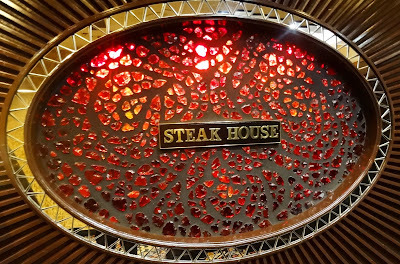 This last weekend we returned to see if Harrah’s Steak House was still in old school splendor. 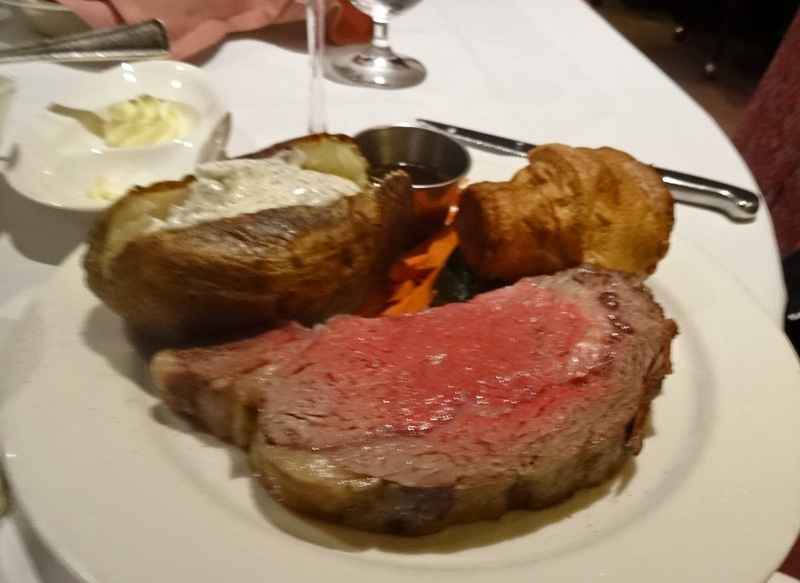 We do have to admit, one is treated like royalty at Harrah’s Steakhouse. You feel the need to dress up in your Sunday finest to be part of the experience here. It starts at the front desk, were the proper maître d greets you and starts the grand procession called diner. The busboy, who was not a boy but a seasoned server that did not have waiter status, was our first food contact. Water, bread, butter and amuse-bouche of crostini, topped with a pate of cheese and herbs was immediately served. Finally our official waiter gracefully appeared and recited some decadent specials. We really do not need to see the menu because we usually order the same meal at any steakhouse we participate at. We do sneak a peek to see the pedigree of the beef and whether or not we will have to mortgage the house to pay the bill. This particular steak house has the most decadent creamy five onion soup served in a hollowed out Carruso onion topped with Gruyere cheese. Ms. Goofy cannot resist this fun decadent starter to her meal. After our first course a palette cleanser of lime sorbet and champagne is offered as a nice touch. The steaks were rolled out on an elegant cart with polished silver domes covering our USDA prime steaks. Perfectly cooked to beefy satisfaction was what we expected and received. The meal was coming to an end and it was time to see if the Crumb Sweeper would appear. I did strategically place some bread crumbs near my half full water glass. I wanted to avail the busboy every opportunity to see these lost crumbs. The table was cleared. The busboy returned to refill the water glass. The moment of truth had arrived. Sadly those wayward lost crumbs are still on the table for eternity. 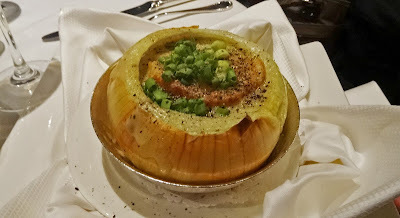 Harrah’s Steakhouse still is an elegant steakhouse experience but; The Crumb Sweeper has died. What does this Mad Meat Genius have for dinner after eating ribs all day at the Best of the West Rib Cook-off? Steak, of course is our choice. Ms. Goofy and I love a good piece of prime or choice aged beef. We also enjoy the ambience and service of an old school steak house. 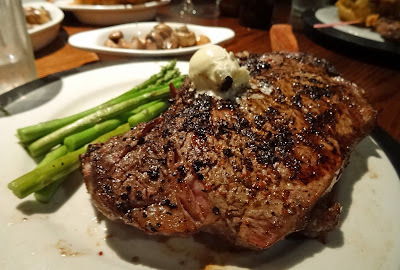 We are always asking locals and searching the World Wide Web for new/old steak houses. Ruby River Steakhouse was located across the street from our casino/resort. I noticed how full the parking lot was at dinner time. This usually is a good indicator of greatness to come especially in a town were steak houses are abundant. Parking karma was not needed at this location because we could walk across the street from our hotel. The outside of this establishment is fairly non-descript. Once inside we were greeted by a low lit fun and quirky decorated eating arena. 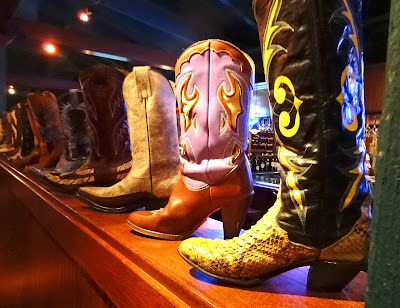 This place definitely had a Western vibration with its line-up of colorful cowboy boots around the bar area. We were seated immediately. The feeling is casual but the service was spectacular. Our server was flawless and we received a visit from the Manager to make sure all was copasetic. The menu is traditional steak house faire. The prices were very reasonable not like the steak house across the street in our resort. I only briefly mention our casino across the street because we once dropped a couple of large bills for a mediocre meal. I ordered a 20 ounce bone in New York and Ms. Goofy a smaller cut of the same. 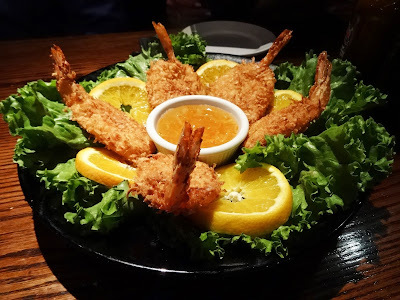 Our meals arrived promptly starting with an appetizer of popcorn shrimp. The shrimp was luscious with a batter dusted with coconut. The dipping sauce was an orange marmalade. This was a great way to start the meal. The steaks arrived and we were happy. 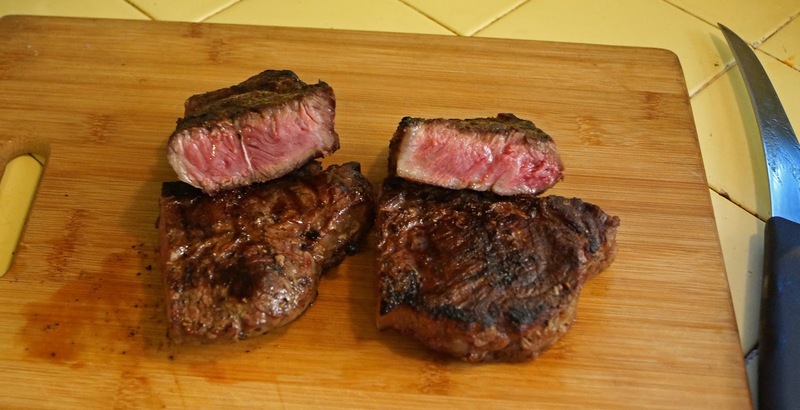 Both of our steaks were cooked to a perfect medium rare. Corn-fed beef at its finest was the verdict. I do want to point out the potato Ms. Goofy ordered as a side. 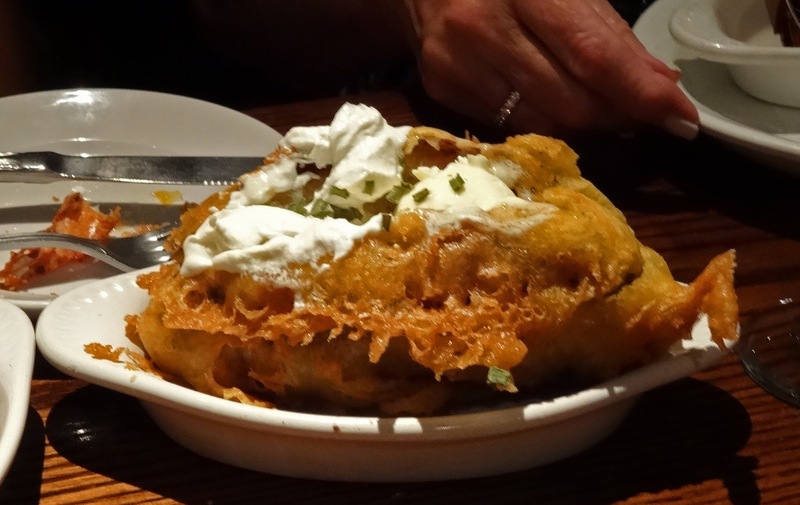 It was baked and then deep fried with a batter crust. She did not expect this. It was unique. The bake potato was fine but the crust was a little on the oily side. This was only a minor flaw in a wonderful meal. 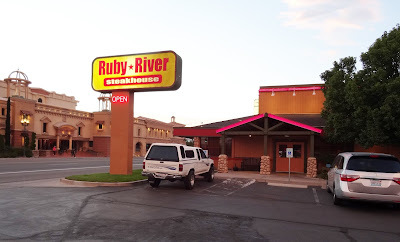 We now know why the parking lot was full at Ruby Ridge Steakhouse. The locals know their stuff. The prices were more than reasonable and a breath of fresh air in this town of excess. It is not often you find a value in a quality steak house meal. We will definitely return when we are in town. One of our highlights of the 'Best of the West Rib Cook-off' held in Sparks Nevada this Labor Day weekend is the rib eating contest which was held Wednesday evening. I have to admit we are fans of Joey 'Jaws' Chestnut. We have watched and followed his domineering career in the mass consumption eating arena. 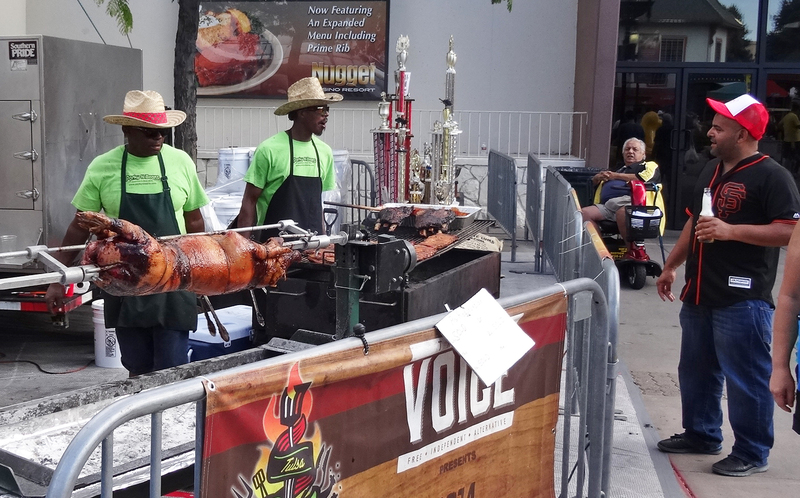 He has been the King of asparagus, hot dogs and rib eating. Nobody has come near his throne until now. Matt 'Meagatoad' Stonie is the new kid on the block. At Coney Island's Nathan hot dog eating contest Matt beat Joey to demand respect. We were ringside tonight to see the latest battle between the old regime and new. We arrived half an hour early to take our place at front stage. This has its risk being so close in case of a possible "Reversal of Fortune'. We were not scared. We were there to root on our hero Joey. The announcer whipped the crowd into a ecstatic flurry of emotions with his fancy banter. The bell was rung and the eating frenzy began. This was an intense and possibly the longest 12 minutes we have ever witnessed. Ms. Goofy actually got hit by a wayward airborne piece of rib. We are not sure if a contestant inadvertently threw it or the unthinkable. Ms. Goofy survived her ordeal and the 12 minutes were completed. 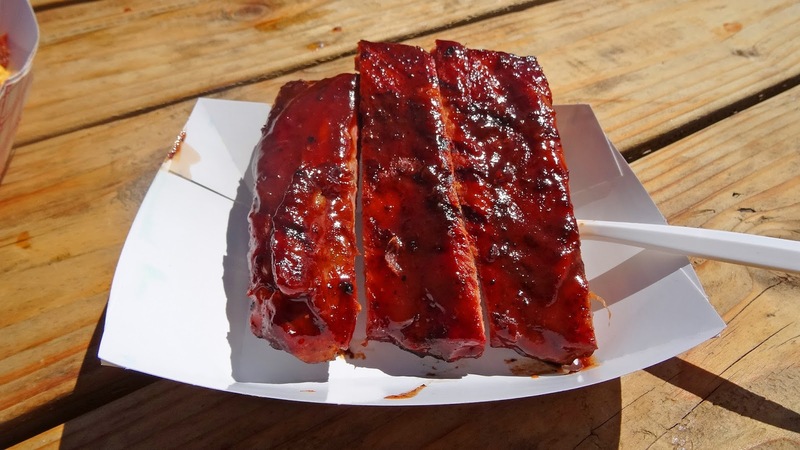 The eaten picked over cleaned ribs were weighed to determine the winner. Matt Megatoad Stonie was declared the victor with 10.5 pounds of ribs. It was a spectacular battle. The results were a little disappointing for Joey Chestnut fans but this was rib eating competition at its finest. Congratulations King Stonie.